Carol Dweck's mindset theory has now been fully tested by Smiley et a. (2016). To understand how they did this, I'll first try to summarize Dweck's theory (see picture below which is mine but was inspired by Smiley et al. 's paper). 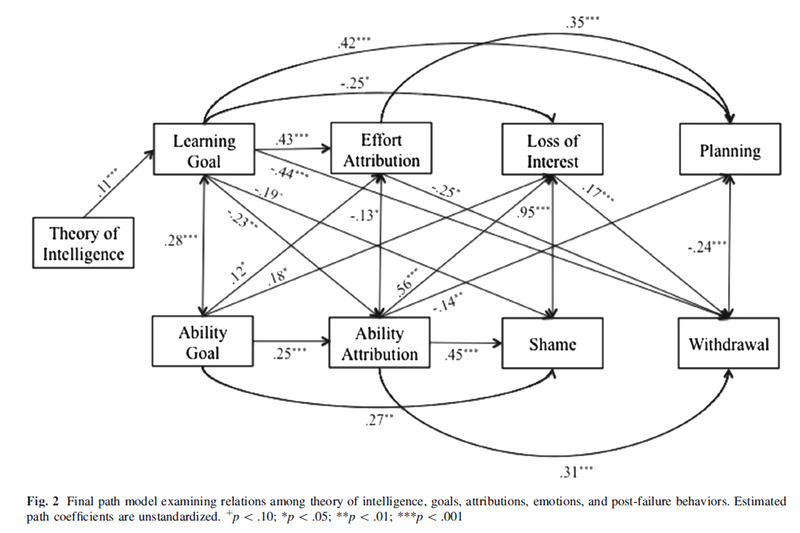 As the picture shows, according to the theory, people's beliefs about whether intelligence can be developed predict the type of goals they set which predicts how they will explain failure (attribution style), which will then predict their emotional response which predicts their post failure behavior. The model says that people with a growth mindset tend to choose learning goals, which focus on the development of competence. Learning goals, then, tend to lead to effort attribution which means that failure will be seen as having not put in enough effective effort. This effort attribution will lead to sustained interest and persistence. Conversely, people with a fixed mindset will tend to choose ability goals, goals which focus on demonstrating ability. People choosing ability goals will tend to attribute failure as and indication of lack of ability. When experiencing lack of ability people will tend to feel shame and loss of interest which will make it more likely they will disengage from the task. Smiley et al. obtained questionnaire data from 261 students on implicit theories (mindset), achievement goals, attribution styles, emotions and post failure behavior. Through path analysis they found results which largely support Dweck's framework as the figure below shows. There were a few relations from Dweck's model which were not confirmed. The most notable deviation from Dweck's model I found that a fixed mindset did not predict ability goals. "Students who endorse an incremental theory of intelligence are more likely to make plans to improve their performance after a setback, due in part to their holding learning goals in academic situations and to their focus on the positive role that effort can play in achievement. 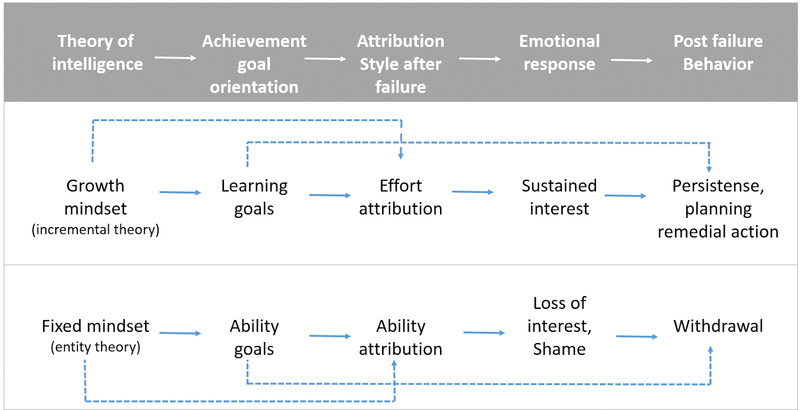 In comparison, students who hold ability goals are more likely to withdraw from challenges, due in part to their focus on lack of ability as the reason for failure and their tendency to experience de-activating loss of interest/excitement after a setback." Two limitations of this research were that all data were self-report data and that the setback failure experience was created by having the students read a hypothetical failure scenario in which they were the protagonist. What I mainly take from this study is the indication that types of achievement goals one chooses have important effects. 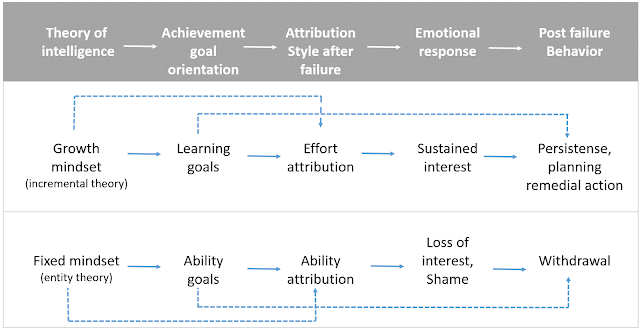 Learning goals seem to be protective against withdrawing after failure while ability goals make it more likely that one disengages after failure experiences.